While not a laser, i'd like to give this light quick review here, since i'm quite imrpessed for it, especially since it was only $37 shipped (from https://intl-outdoor.com/emisar-d1s-thrower-p-926.html). I got the black version with the cool white LED. 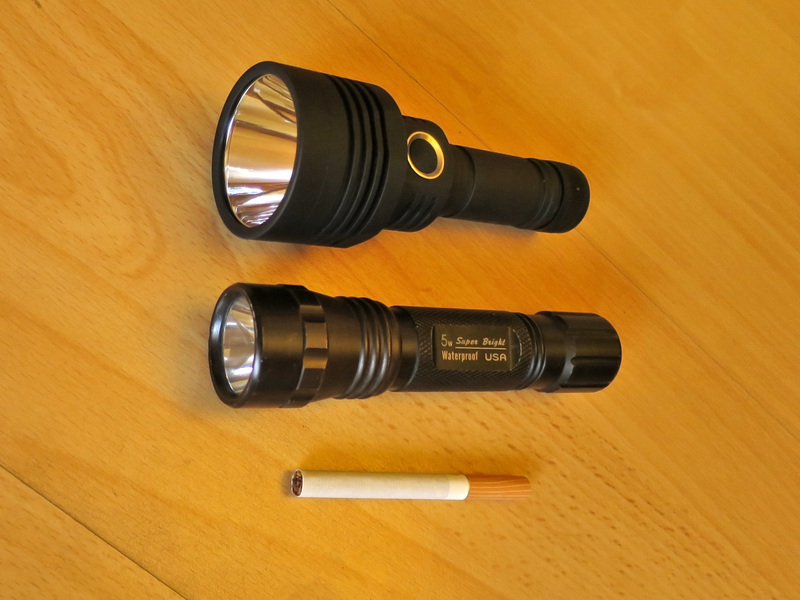 Here are some images of it, with a MXDL flashlight and a cig for size comparison - The MXDL may pretty familiar for LPF members as it was once a popular host to put dvd/bluray modules in, running off 2 16350 cells - the Emisar runs of a single, unprotected, 18650 cell. It's fairly ridiculous at first, it's shorther than the mxdl, but the head/reflector is just 2 mm less wide than that on a maglite 6D. It's at least as deep, and very smooth. The resulting light pattern is a very bright central hot spot, nice corona around it, and usable spill light as well if you would use this when walking outdoors or anything. It also has a ridculously bright 'turbo' mode, claimed to be 1300 lumen. 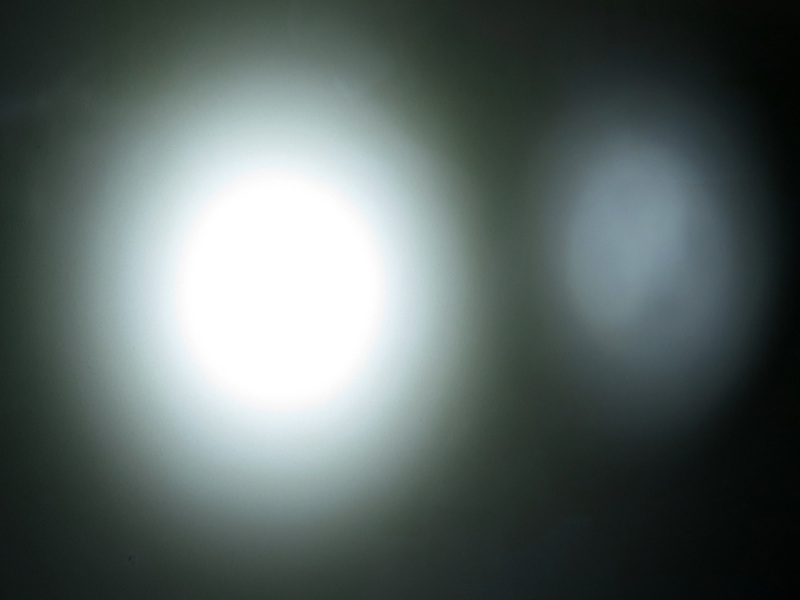 Here is a beamshot onto the ceiling (about 2.5m distance, flashlights on the floor) with the Emisar and the MXDL (which has a upgraded Cree led in it). This flashlight is far, far, far too small to heatsink the dissipation at that power level, and has thermal throttling built into it's firmware. If you leave it on turbo it'll dim after a few minutes to keep the temperature down, though this can apparently be adjusted in software: the problem not being the LED overheating, but you burning your fingers holding the light. If you run it a 'reasonable' output level (say 300 lumen or so) this is no problem at all though, so it's fine as an everyday flashlight too. In normal operation mode it has a seamless ramp up from very dim (may just 2 lumen or so) to turbo-level 1300 lm output level. As everything is controlled by software there is no tail switch that carries any current, just a side button that controls a microcontroller inside. Most of it works very well and intuitively. The only quirk i found is this: you can single click the flashlight to resume previous power level, or to turn it off. From normal mode, or off, you can double click to go straight to full on turbo mode. Also, double clicking from turbo mode takes it back to previous normal mode. But if you single click it in turbo mode it will turn off... and then turn on again at turbo mode even with a single click (so it forgets the 'normal mode' setting then). They found another good application for the turbo mode though: "beacon" where it briefly flashes at full power every second or so, and given the light output it would certainly be a useful beacon for something like a road (or even runway...) obstruction. Kudos to the person that designed this flashlight, apart from a few firmware oddities i doubt you could have done a better job at this price point. I'm not a big flashlight fan, but this seems to be a good thrower at a very reasonable price. By unprotected cells, do you mean no button top? I have some unprotected cells with button tops, so I need that clarification. If I ever to feel the need for something that is very bright, I will keep this one in mind as it seems to be very inexpensive compared to the other high power flashlights I've seen. 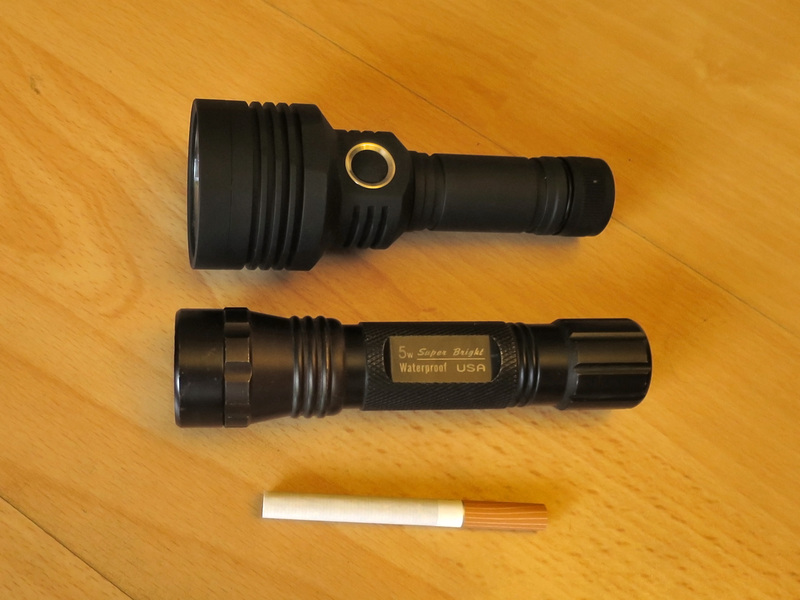 I might to get one Emisar D1, because there is always room for another flashlight. I almost bought a version of this light that was sold by Kaidomain back when they were still in business; I was going to use it as a neat little host for a laser project. By unprotected cells, do you mean no button top? I have some unprotected cells with button tops, so I need that clarification. A button top should fit, as long at it conforms to the 18650 size spec. There (also) is a spring on the positive side, so there is some tolerance, but it's a tight fit - if the button is like 'just protruding' such that you can put them in series in a barrel it'll work out fine, but if it's a tall button it may not fit. The problem with the protected ones is that they simply are too long in overall size for the bottom cap to be screwed on fully, which is required to make the electrical connection for the negative side. The protection boards often add over a millimeter to the overall side, and also have a button top, which combined makes the too long. I presume the flashlight itself has some battery protection circuitry built in so you can't run your Liion cells down far enough to damage them. Correct? If not that would be a pretty serious design flaw! And at the same time, it would also be nice if the software allowed the user to bypass this protection in an emergency. Thanks for that information, Ben. I might get one of these someday and knowing what size battery they take would be important to me. I presume the flashlight itself has some battery protection circuitry built in so you can't run your Liion cells down far enough to damage them. Correct? It does have that - when the cells goes down to 2.8 volts or something it will only run in very low power mode, and afaik stop completely when it drops below 2.7 or so. It's probably best to take out (and charge) the cell at that point. It is a software switch, so it will use a tiny amount of current even when disabled due to low cell voltage. This is just microamps though, and it will also use that tiny current when turned off. All flashlights that don't have a physical switch that breaks the power (like a tail clicky) have this issue though. Yeah, i thought i'd just mention this - it also applies when charged. I'm not sure what the standby consumption is (doubt i could measure it). I doubt it would apply to this flashlight, but some people just throw one in their car glovebox and expect it to work in an emergency 3 years later. That's probably not a good idea even with a fully charged battery. But you'd want something running of a non-rechargeable lithium battery for that anyway as those can hold a decent charge for decades, that's also the reason they use those cells for professional applications. Yeah, I've found some Li-ion batteries I put away charged several years ago and, surprise, they weren't even half charged when I came across them again. I have some non-rechargeable Li batteries in a flashlight for over six years now and they still have the full charge on them as I rarely use that flashlight. Rechargeable lithium cells just have some inherit self discharge, though it's very small compared to things like NiMH or NiCd cells that run flat when left on a shelf for a few months (or years for the specific low-self-discharge types). Afaik they don't really do 18650 sized primary lithiums though, though for emergency lights they are not much use. Then again as an emergency flashlight to throw in the glovebox and forget about you'd probably go for something with a tail clickly and a couple of AA alkaline cells, which will also fair quite well when unused. Yeah, the ones I have are CR123s. I have not found them in the 18650 size either. You do have some camera batteries that are more or less two 16350 format cells in series, but side by side. Those probably date mostly back to the days of analog camera's where they would only be used for light metering and such, and it would be a nice feature to have a camera that just worked after being in a drawer for a year between vacations or such. Then again the standby use isn't that big a deal either, if it is just something like 100 uA (fairly typical value for a uC) it would take several years to drain a fully charged battery. I no longer have any of my old Minolta cameras, so I don't have those batteries either. I did buy my daughter a very nice film camera body with a couple of lenses, but she never used it to my knowledge. I bought her a digital camera a few years ago and she has used it. What ya gonna do? Nothing... the advantage of being immediately check if a shot was good on a digital camera is such a big plus that it leaves very little room for film camera's. I've used analog camera's as a kid, and it would always be a bit of a surprise how the shots came out after having them developed.